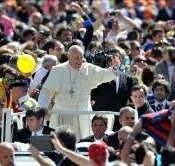 (Vatican Radio) In the first appointment of his one day pastoral visit to the Italian region of Molise Saturday, Pope Francis urged people to follow God in ‘breaking the mold’ imposed by the current socio-economic system, to transform their reality into a more human – and family- centered one. He called for work-free Sunday’s so mothers and fathers can spend time playing with their children, a ‘science’ he said that we are losing; he urged for a creative joining of forces and ‘jobs pact’ for the region, which suffers from heavy unemployment and he spoke in praise of the ‘labor’ of working mothers. Pope Francis’ first meeting in Campobasso was with the world of labor and industry in the Aula Magna of the University of Molise. The Pope was greeted by the Rector and then was briefly addressed by a farmer and a Fiat factory employee, the mother of a toddler who is expecting her second child. The Pope thanked them for their words of welcome and for sharing their life experiences, their struggles and hopes with him. “I fully agree – he pointed out – what has been said about ‘safeguarding’ the earth, to bear fruit without ‘exploitation’. This is one of the greatest challenges of our time: conversion to a development that respects Creation. In America, my homeland, I see many forests, which have been stripped … that becomes land that cannot be cultivated, that cannot give life. This is our sin: we exploit the earth and do not let it give us what it harbors within, with the help of our cultivation”. Then he continued: “Another challenge was voiced by this good working mother, who also spoke on behalf of her family: her husband, her young child and the baby in her womb. Hers is a plea for work and at the same time for the family. Thank you for this testimony! In fact, it is a case of trying to reconcile work with family life”. And moving away from his scripted remarks he added: “I’ll tell you one thing: I hear confessions; not so much now as I did in the other dioceses … When a young mom or a dad comes to me, I ask: ‘How many children do you have?’ and I have another question,: ‘Tell me, do you play with your children?’. Most respond: ‘Pardon Father?’ – ‘Yes, yes: do you play? Do you waste time with your kids? ‘. We are losing this knowledge, this wisdom of how to play with our kids. The economic situation compels us to this, to lose this. Please waste time with your children! On Sunday: she referred to Sunday as the family day, to spend time together … “. “This – he continued – is ‘critical’, a point that allows us to discern, to assess the quality of the human economic system in which we find ourselves. And this also raises the issue of working Sundays, which affects not only believers, but it affects everyone, as an ethical choice. We are losing this free space! The question is what do we want to prioritize? A work-free Sunday – with the exception of necessary services – says that our priority is not to economics, but the human being, gratuity, non-commercial relations, rather family and friends, for believers it means a relationship with God and with the community. Perhaps it is time to ask whether it is a true freedom to work on Sundays. Because the God of surprises and the God who breaks the mold, surprises and breaks the mold so that we may become freer: He is the God of freedom”. “Dear friends – continued the Pope – Today I would like to add my voice to that of many workers and employers in this area in asking for the implementation of a “jobs pact”. I see that in Molise you are trying to respond to the tragedy of unemployment by constructively joining forces. Many jobs could be recovered through an agreed strategy with the national authorities, a “jobs pact” that knows how to seize on the opportunities offered by National and European regulations. I encourage you to continue on this road, which can lead to good results here as well as in other regions”. And again moving from his scripted speech, the Pope added: “I would like to return to a word that you said: dignity. Not having work not only means not having the necessities of life: no. We can eat every day: we can go to Caritas, to this association or to that club, where they will give us something to eat. But that’s not the problem. The problem is not being able to bring the bread home: this is serious, and this robs people of dignity! This takes away their dignity. And the biggest problem is not hunger, there is a problem. The most serious problem is dignity. For this we have to work and defend that dignity that work gives us”. He then concluded: “Finally, I would like to tell you that I was struck by the fact that I you have gifted me a painting that is on ‘motherhood’. Motherhood involves labor, but the labor of childbirth is oriented to life, is full of hope. So not only thank you for this gift, but I thank you even more for the testimony which it contains: that of a hopeful labor. Thank you! And I would like to add a historical fact, that happened to me. When I was Provincial of the Jesuits, I needed to send a chaplain to Antarctica, to live there 10 months a year. I thought … and one man went. And you know what, he was born here in Campabasso… Thank you.